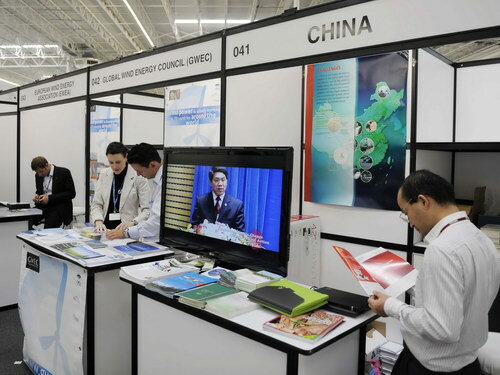 China’s NGO exhibition stand at the 16th United Nations Climate Change Conference in Cancun, Mexico. a 500 million euro loan to help with climate changes in China. The Ministry of Finance signed a second climate-change framework loan with the European Investment Bank (EIB) on Friday, borrowing 500 million euros ($ 663 million) for projects supporting climate-change mitigation. "The first round of the framework loan in 2007, which was also for 500 million euros, has born fruit in reducing greenhouse-gas emission and applying renewable energy. We expect to maintain a stable cooperative relationship with the EIB on this matter in the future," said Li Yong, vice-minister of finance, at the signing ceremony. The loan has a 25-year term, and the projects it finances will significantly contribute to the EU-China strategic partnership and cooperation with China on climate change, and help the country to achieve ambitious development goals set for coming years, the EIB said. China has vowed to reduce CO2 emissions per GDP unit by 40 to 45 percent, compared with the 2005 levels, and to increase the proportion of renewable energy to 16 percent by 2020. EIB Vice-president Magdalena Arza said the operation ranks among the bank’s most efficient loans in terms of greenhouse-gas emissions reduction. "China has established qualified institutions to supervise projects funded by the first investment, ensuring effective use of the allocation of our first 500 million euro investment." She estimated that up to three million tons of CO2 would be cut from emissions every year in China by projects funded by the loan. Projects were selected on the basis of making more and better use of renewable energy sources and enhancing energy efficiency, and some plans may generate carbon credits, said the bank. The projects include 125 million euros for four wind farms in Henan, Hainan and Guangdong provinces; 70 million euros for emissions reduction and energy efficiency improvement in chemical plants of the Haohua group; 50 million euro for afforestation in Jiangxi province and the Inner Mongolia autonomous region; 50 million euros for a combined-cycle power plant at the Wuhan Iron & Steel plant; 44 million euros for ten small-scale hydroelectric power plants in Hubei; 35 million euros for pollution reduction at a cooking plant in Shaogan City; 31 million euros for district heating and a power plant in Jinan City; 30 million euros for chemical-plant-emission reduction in Qiakou; and 29 million euros for photovoltaic urban lightening in Chaoyang, according to EIB. "The projects in China funded by our investment match up with the EU’s long-term target, which is powering 20 percent of the EU’s energy consumption by clean energy. That’s the reason why we are undertaking this project," Arza said. The first loan dates from 2007, when the bank loaned 500 million euros to China, 85 percent of which has been used to support projects reducing carbon dioxide emissions by the end of this year. Apart from that investment, the EIB is also involved in other projects in China. The bank invested another 500 million euros in the extension of Beijing Capital International Airport and contributed 118 million euros to the reconstruction of a reservoir and vegetation destroyed in the 2008 Sichuan earthquake. Established in 1958, the EIB is a long-term lending institution of the EU, financing capital investment that promotes EU policy objectives. It has loaned in all nearly 1.76 billion euros to China including the new climate-change framework loan.